Innovation Loft Attends Front End Innovation's Largest Event To Date | UNLEASH YOUR TEAM’S POTENTIAL! Front End Innovation is the leader in advancing innovation, with the largest innovation and collaboration community in the world. Front End of Innovation 2015 attendees had a chance to tour the Innovation Loft environment, which was a replication of our purpose-built facility, optimized for creative collaboration using principles of Collaboration Environment Construction. The innovative pop-up featured collaborative technology rolling magnetic whiteboard walls that help bring ideas to life. Experts at the Innovation loft provided free tips and consulting on how to construct environments optimized for creative collaboration at your own offices . We also invited attendees to participate in brainstorming sessions led by the Innovation Loft team that were based on discussions by FEI keynote speakers. 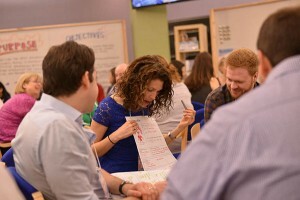 Participation was an opportunity to learn the same types of game-ified ideation techniques the Innovation Loft team uses to help clients like Avis, Visa, Nutrisystem, Clear Channel and NBC to develop highly novel solutions to challenging problems with maximum team alignment. Thank you to all of you who stopped by! Visit Lessons Learned From FEI to read about the valuable information we gathered from attending this Front End Innovation event. If you have any other inquiries about our space or services, please don’t hesitate to email info@innovationloft.com or give us a call at 646-692-3522.